This hardwood is from the sugar maple tree and is also known as hard maple. Smoking with Maple Wood Chips is much like smoking with other fruitwoods like cherry. It gives the food being smoked a sweet and subtle, balanced flavor that is excellent, especially for ham and bacon. 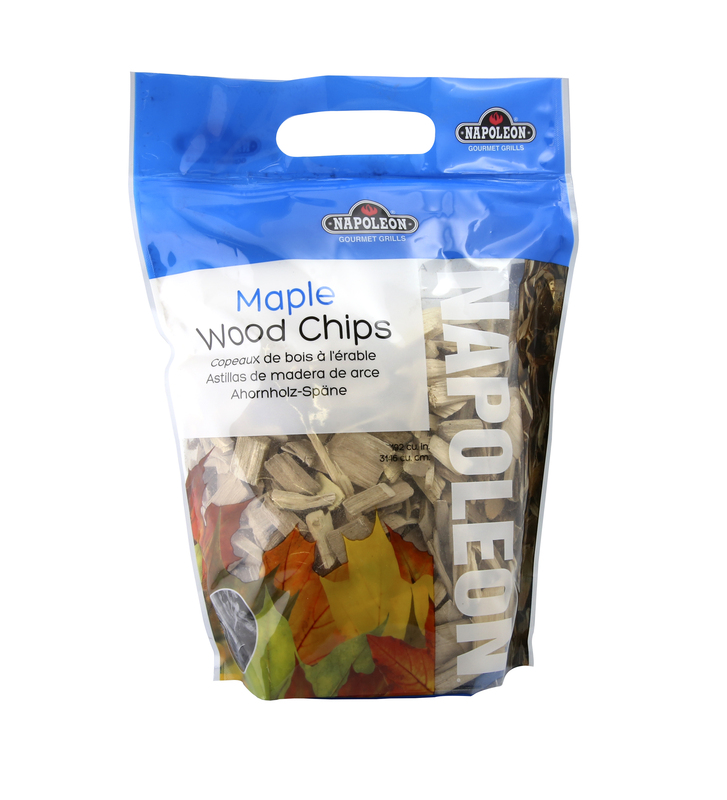 Maple Wood Chips are also great for poultry, pork, salmon, arctic char and trout. To use the Maple Wood Chips, soak them in water for at least 30 minutes before you are ready to smoke. They can also be soaked in apple juice, chardonnay, cabernet sauvignon, honey brown lager and maple lager for added flavor. When they have been sufficiently soaked, remove the Maple Wood Chips from the liquid and place them into a Napoleon Smoker Pipe, and place that pipe directly on the sear plates of your gas grill. Alternatively you can place soaked chips into the integrated smoker tray on the Prestige PRO Series PRO665RSIB Gas Grill. When the Maple Wood Chips begin to smoke, place the food on the grill and close the lid. Remember to keep the lid closed for the best smoked flavor.